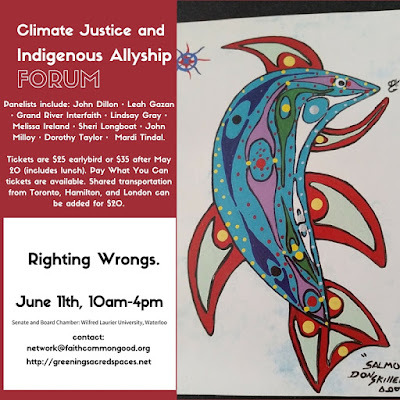 ANNUAL FORUM: CLIMATE JUSTICE AND INDIGENOUS ALLYSHIP. Save the Date: June 11th, 2016! — Climate Justice and Indigenous Allyship. Waterloo, ON. REGISTER TO JOIN US!! Shared transportation from Toronto, Hamilton, and London can be added for $20. Panels will address allyship, the interfaith response, and climate justice. Panelists include: John Dillon • Leah Gazan • Grand River Interfaith • Lindsay Gray • Melissa Ireland • Sheri Longboat • John Milloy • Dorothy Taylor • Mardi Tindal. Saturday, June 11, 2016, 10:00 a.m. – 4:00 p.m. Presented by: Faith & the Common Good, the Green Awakening Network, Divest Waterloo, Sacred Water Circle, and the Centre for Public Ethics at Waterloo Lutheran Seminary, a federated college of Wilfrid Laurier University, with funding support from the Justice and Reconciliation Fund of the United Church of Canada.